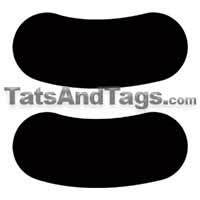 Welcome to Tats and Tags. We specialize in custom temporary tattoos, long lasting personalized just for you. We also make custom pendants, drink coasters and decals. Check out our large selection of realistic stock temporary tattoos designs for both kids and adults drawn by real artists - proudly made in the USA. 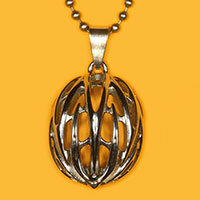 We also have a great variety of bicycle jewelry too - check it out! 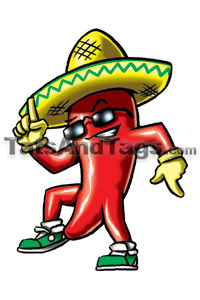 And don't forget to pick up some Cinco de Mayo temp tats for your parties! Design your own custom temporary tattoos. Designs are made to your specifications. Prices starting as low as $100 for 1,000 tattoos. Minimum order for custom tattoos is 1,000. We have the biggest and best swimming designs in stock. We can make custom tats for your swim team as well. 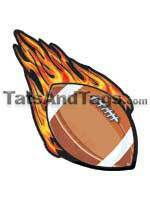 We can make your school mascot temporary tattoos to your match your colors and specifications. 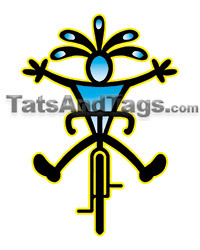 And of course we can use your artwork to make your logo temporary tattoos. Several mascot designs are in stock - see our small section. 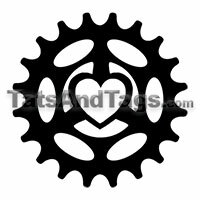 Check out our bicycle designs. We are known for our music and bicycle jewelry. We can also make custom pendants for you.